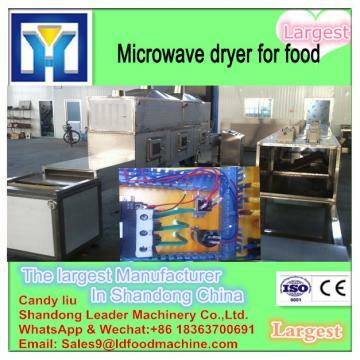 Following are the sizes of hot selling continuous microwave dryer. The microwave dryer is used to dry all kinds of fruits, vegetables, spices, seasonings, herbs in low temperature to preserve the original nutrition of them. We have speical microwave dates dryer, microwave chilli dryer, microwave mushroom dryer. Microwave drying machine has a number of quantitative and qualitative advantages over conventional drying machines so that it becomes more and more popular. One main advantage is the place where the heat is generated, namely the product itself. Because of this, the effect of small heat conductivities or heat transfer coefficients does not play such an important role. Therefore, larger pieces of foods can be heated in microwave dryer in a shorter time and with a more even temperature distribution. 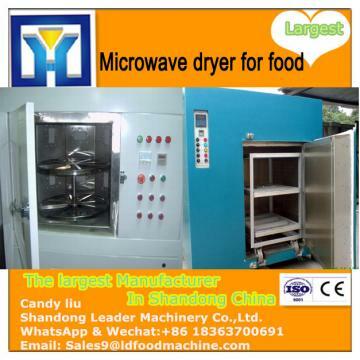 The another main advantages is the short drying time, low drying temperature of industrial microwave dryer oven. Wooden packing for each set of microwave dryer if needed. LD provides a full range of services and technical support for industrial microwave systems, for both drying oven and continuous drying machine. The services include custom installations, preventive equipment maintenance, equipment upgrades and modifications and microwave system repair. Using scientific structure and patented suppression system, LD industrial microwave dehydrator poses no threat of electromagnetic radiation to the health and safety of equipment operators. In addition to downtime for cleaning and inspection, conventional dehydrators and heat exchangers need periodic servicing with an expensive inventory of parts and a highly trained labor force. For microwave dehydrator, the only part that requires maintenance is the magnetron. In the event of a malfunction or misuse through incorrect operation, this can easily be replaced in less than thirty minutes. Generally, LD recommends that the magnetron of industrial microwave dehydrator be replaced annually or after 8,000 hours of operation, whichever is sooner. Industrial microwave cabinet dryer for fruits and vegetables/ industrial microwave oven/ microwave spices dryer oven is an electromagnetic wave whose frequency is between 300MHZ~300GHZ and wavelength is between 1mm ~1m. the characteristics of microwave usually shows penetration, reflection and absorption . For glass, plastic and porcelain, microwave will penetrate it without being absorbed. For water and food, it will absorb microwave and heating by itself. For metal material, it will reflect the microwave. Microwave drying : Water molecule is polar molecule, it will change its polarity and friction motion caused by the effect of high speed change of high frequency electormagnetic field. Then the microwave electromagnetic filed energy can be converted into heat energy and achieve the purpose of drying. Due to the strong penetrability, Industrial microwave cabinet dryer for fruits and vegetables/ industrial microwave oven/ microwave spices dryer oven can heat up the material outside and inside simultaneously and evenly, so that won't appear the condition that the outsie dry but inside wet. The formation of body heat source state shortens the time of heat conduction and save a lot of drying time. Microwave sterilization:industrial microwave cabinet dryer for fruits and vegetables/ industrial microwave oven/ microwave spices dryer oven temperature is from 70℃~105℃, period is from 90 seconds ~180 seconds. Microwave thermal effects can change the bacterial protein and make bacteria to die owing the loss of nutrients, reproduction and survival.Meanwhile, Microwave eletromagnetic field can make normal growth and stability of the genetic breeding of bacteria nucleic acid.